Back in August 2016, the SQ1 by RNG (Rise-N-Grind) Products was successfully funded on Kickstarter to the relatively modest tune of $10,299. To be fair, at $25 per pen, it’s probably one of the least expensive Kickstarter pens I own, yet it’s still a pen that I happen to like. And, frankly, there’s a lot to like about the SQ1, not least of which is the “shipwrecked copper” cap. Though other color options/combinations were made available through the Kickstarter campaign, I chose these weathered ends against an anodized blue barrel. It’s one of the coolest-looking pens I own, and it’s a killer piece for the pen holder on my desk. It’s pleasant to write with too; the grip section is patterned with divots that add a nice visual and practical touch. 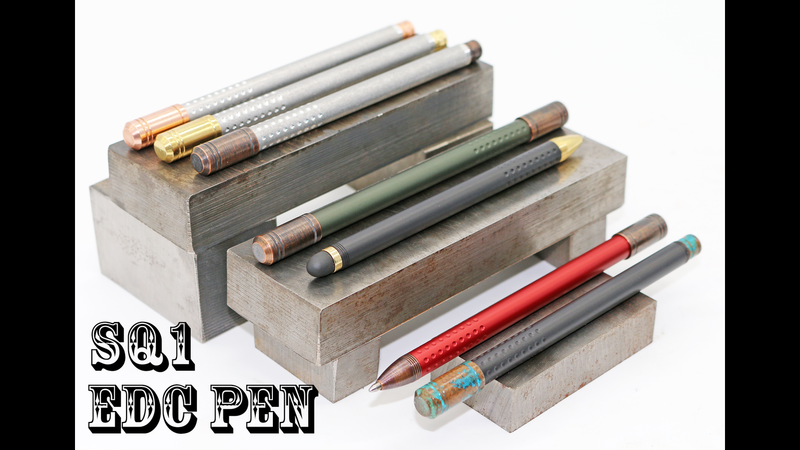 It’s comfortable to hold, and the included Fisher Space Pen refill is always a great choice. Since the SQ1 is made from CNC-machined aluminum, making it durable and slender, it’s tempting to think of it as an “everyday carry” pen – it is, in fact, advertised as such. However, I think this classification is a mistake. For one thing, the cap screws on and off, requiring four full, squeaky rotations. 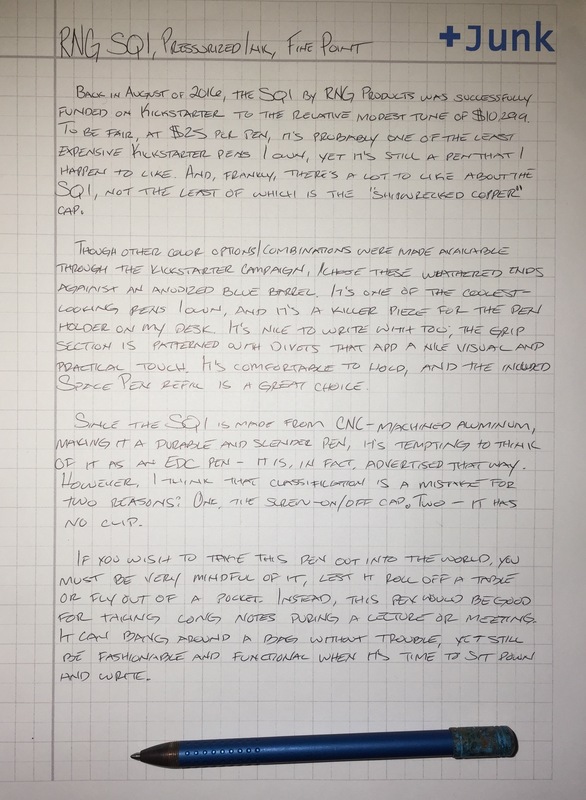 Though there is threading at the top of the pen that allows for posting, it’s still a little tedious – tedious enough, anyway, that you wont want to be using the SQ1 for taking short, frequent notes. Additionally, the SQ1 has no clip, a trait that has caused me trouble in the past. If you wish to take this pen out into the world, you must be very mindful of it, lest is roll off a table or fly out of a pocket. Instead, this is a pen that would be good for taking long notes during a lecture or meeting. It can bang around a bag without trouble, yet still be fashionable and functional when it’s time to sit down and write. Though the Kickstarter campaign is long over, you can still get these pens on the RNG Products Etsy page for $35. A review at The Pen Addict counted six turns to screw/uncrew the cap and notes that changing the refill is a bit of a hassle. Luckily, Space Pen Refills last quite a long time, in my experience. A review at The Clicky Post shares my love of that refill. More reviews, with good pictures from Inkdependence and Office Supply Geek.